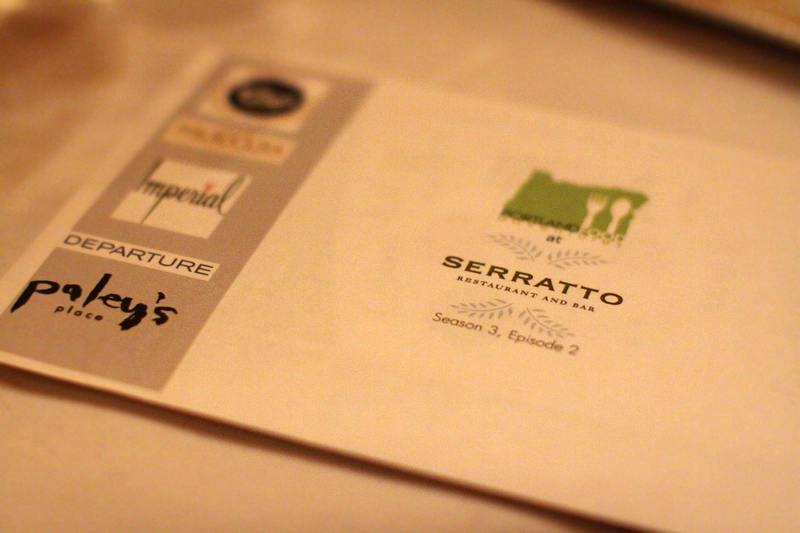 Our latest installment of Portland Food Adventures began on a crisp autumn night inside the elegant Serratto, a lively restaurant residing in Northwest Portland’s 21st district. 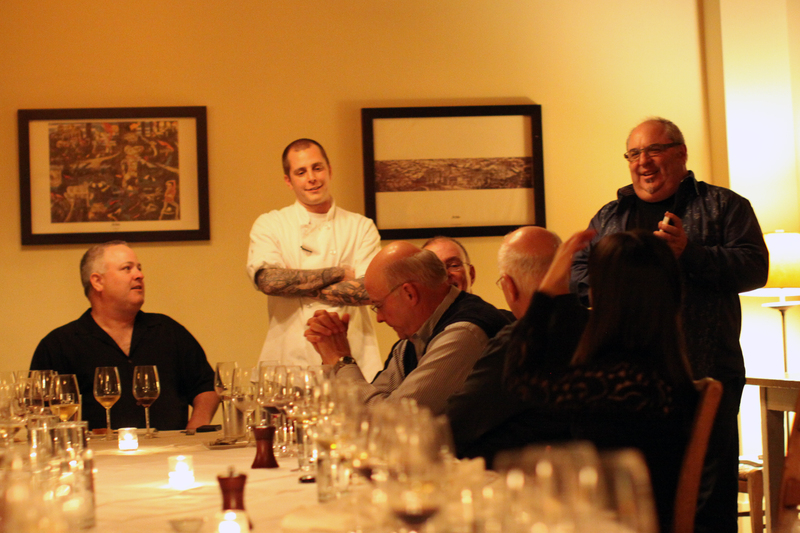 Though known for it’s Tuscan cuisine, tonight we had the pleasure of combining Serratto’s chef Tony Meyers with local Game master Geoff Latham of Nicky Farms, for a unique and delicious menu served in their private dining room. As the Adventurers started arriving, we were started out with a refreshing and bubbly Domaine Huet. 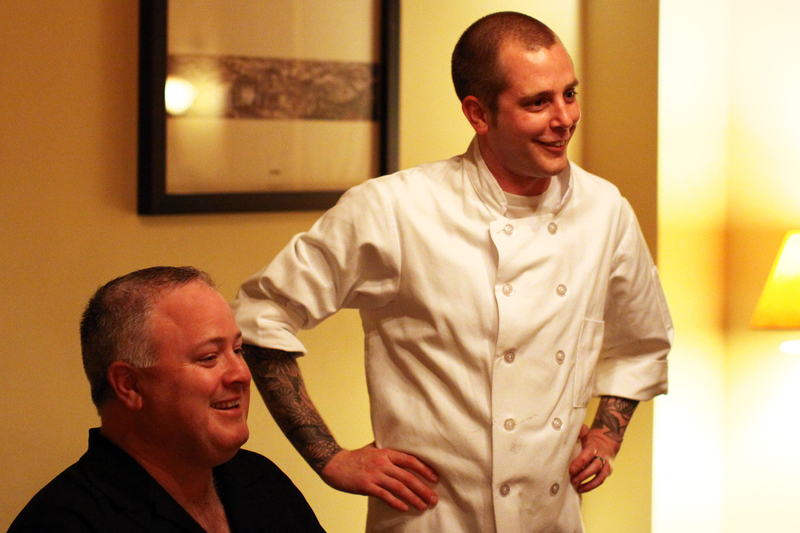 As everyone settled down to our long white dining table, our host, Chris Angelus, introduced us to chef Tony Meyers for an introduction to the menu. 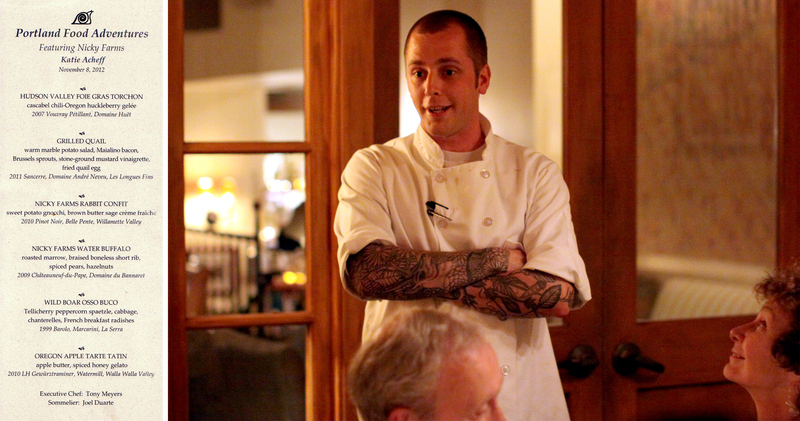 His appearance was brief as he had much work to do in the kitchen, and handed over the spotlight to Geoff Latham to talk a bit about Nicky Farms. Geoff walked us through the different types of game we’d be having including foie gras, quail, rabbit (their specialty), water buffalo and wild boar. He mentioned being particularly excited about the water buffalo, and without further ado we were served our first course, Hudson Vallet foie gras tochon with a cascabel chili-Oregon huckleberry gelee. Next up was my personal favorite of the night, Grilled Quail with a warm marble potato salad, Maialino bacon, Brussels sprouts, stone ground mustard vinaigrette and a fried quail egg. 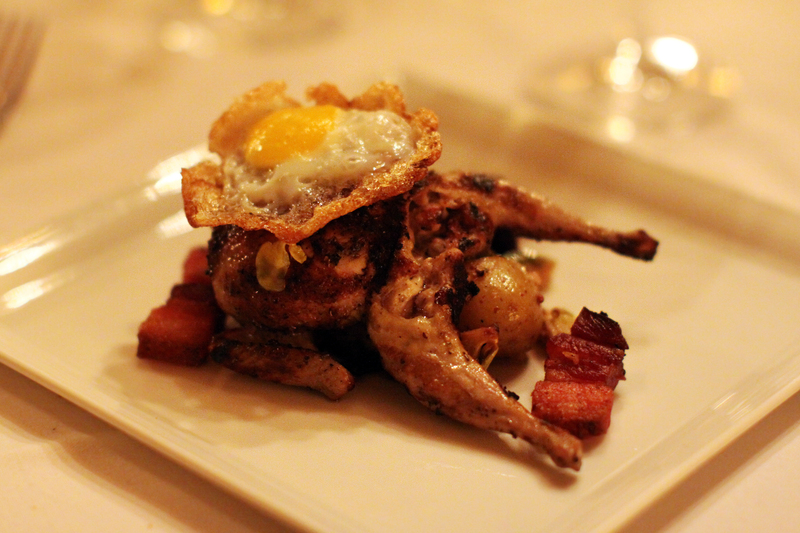 Hard to resist the combination of the savory quail, fried egg and bacon, all seasoned to perfection. 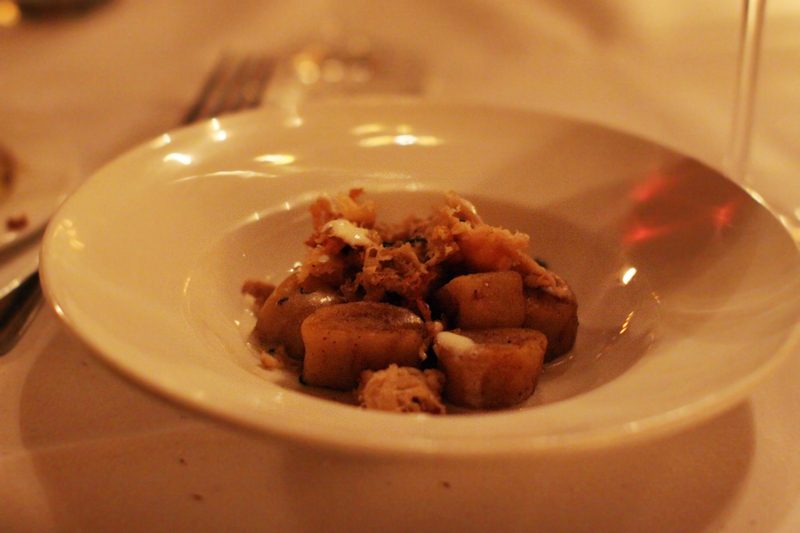 The night continued with many ‘cheers’ and a room full with energy, as we got our third course, a rabbit confit with sweet potato gnocchi, brown butter sage crème fraiche, and served with a 2010 Pinot Noir from Belle Pente. 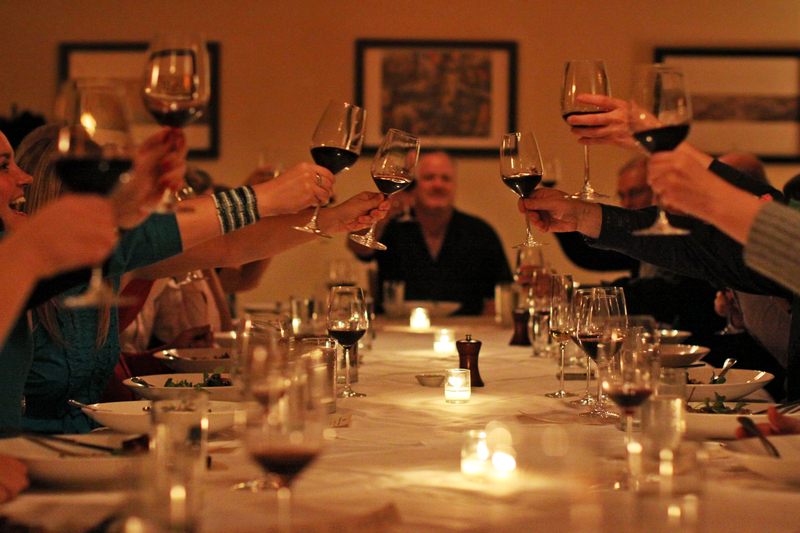 Next up we were poured a 2009 Chateauneuf-du-Pape, to be paired with our fourth course, a Nicky Farms Water Buffalo roasted marrow and braised boneless short rib, with spiced pears and hazelnuts. The short rib was amazing! And as this was my first time eating marrow, I think I did okay with the very interesting texture. 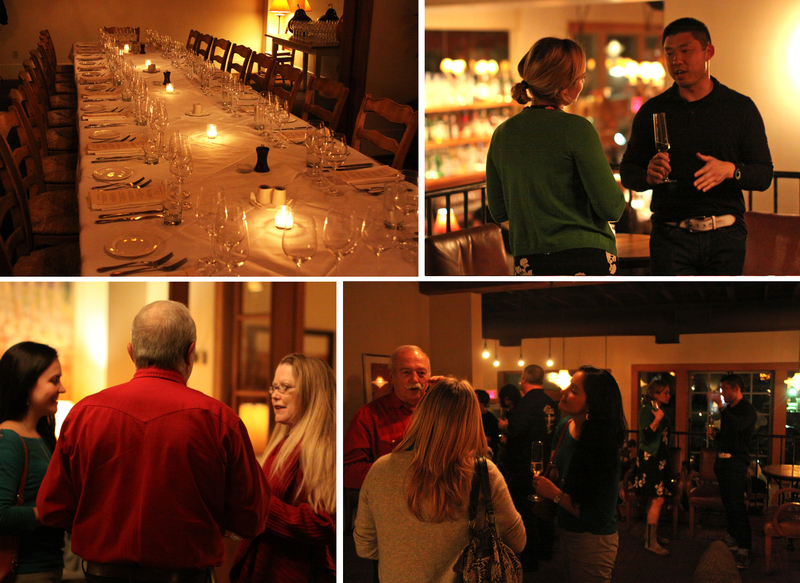 Chef Meyers came back out for some socializing as we were served our fifth course, a wild boar osso buco served with a 199 Barolo. Chris also started up a PFA trivia match, to see how much the Adventurers know about Portland food culture. Questions included “Who did Vitaly Paley beat on Iron Chef and what was the secret ingredient?” and “Which Portland restaurant served the famous chicken on Portlandia?” The group did surprisingly well on even some of the harder questions, and Chris gave out a few $25 Paley’s Place gift certificates to the winners. 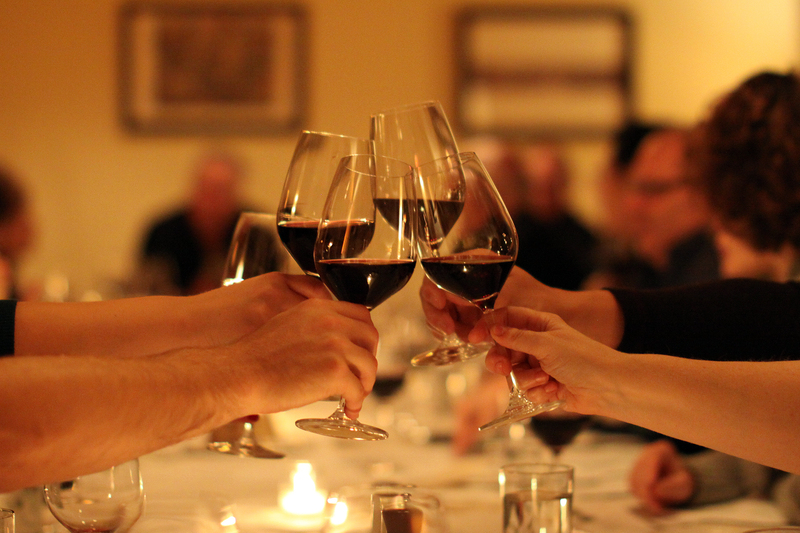 As the evening started to wind down our hosts thanked us and talked about some of the future events, which prompted a table wide ‘cheers’ for such a great evening! Chris also talked to us about some of the awesome gift certificates we all received for the evening, which included Departure, Imperial and Chop. We were served our final dish, an Oregon apple tarte tain with apple butter and spiced honey gelato. 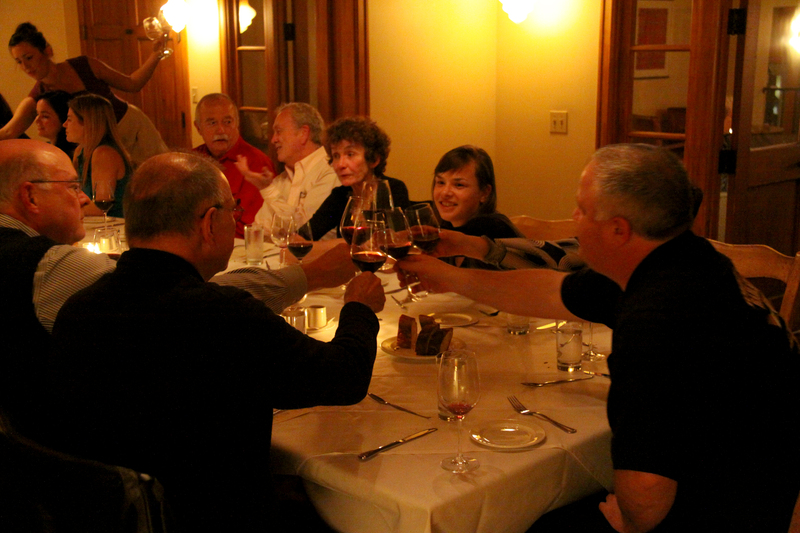 And with a round of applause another fine Portland Food Adventures came to a close. 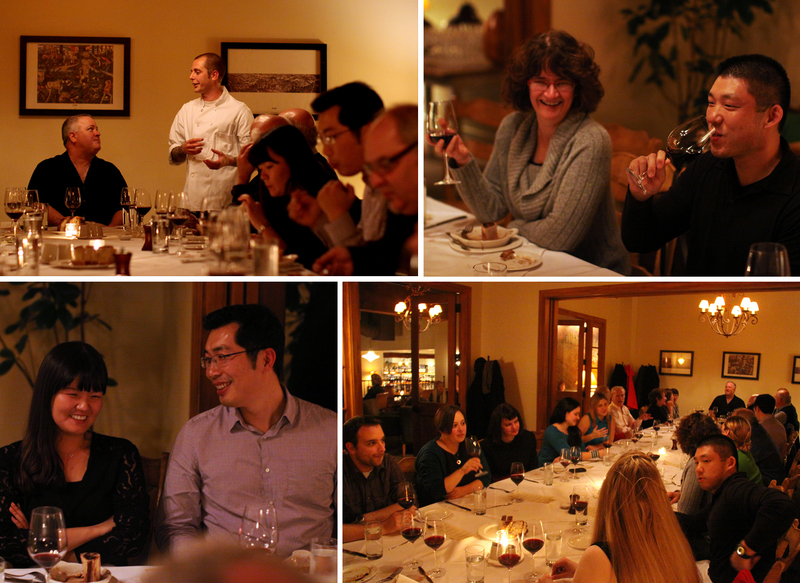 It was a very lovely night full of amazing game dishes and a great group of people. Looking forward to next time!